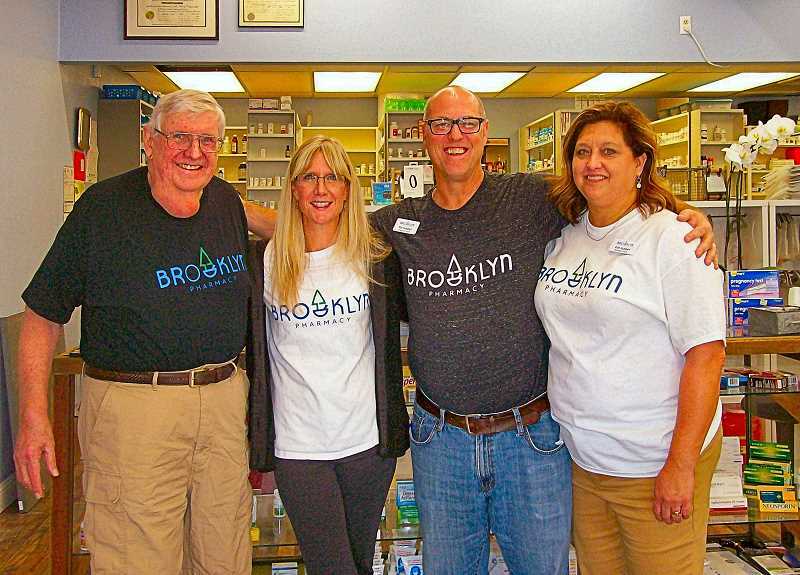 One of the long-established businesses in the Brooklyn neighborhood – Brooklyn Pharmacy – gained a new owner last year, when its longtime proprietor, Pharmacist Mike Dardis, retired. It has remained open at 3131 S.E. Milwaukie Avenue while new owners Pat and Kim Hubbell engaged in a very extensive, months-long remodel. The work is now done, and it was celebrated with a Grand Re-Opening on Saturday, October 20. The Hubbells took time out to greet neighbors and guests with smiles, snacks, balloons, free tote bags, and informal tours of the newly-restored building. Mike Dardis, who owned and operated the business for decades, was also on hand to enjoy the updates; his daughter Kelly McAlbin continues working there as a Pharmacist. After a half century of serving the neighborhood, Dardis remarked with a grin, "After 53 years, I just kind of ran out of gas." Brooklyn Pharmacy is one of the very few privately-owned drugstores in Portland. Dardis reflected, "It was very important to me that the business retain its name and historical community traditions. When I met Pat Hubbell [who received his pharmacist's license in 1993 from the University of Kansas] we hit it off immediately. He had co-owned a Kansas pharmacy for eight years before moving here, so he knew all the ins and outs of the business." For his part, Hubbell told the THE BEE, "It's great having Kelly here as a second Pharmacist, in case I have to go somewhere during the day. Her son and our kids also work here as part of our staff of seven. Our two pharmacy families came together ideally, to make a nice transition for the business." Hubbell has been working with contractors and city permit processes to update the building while maintaining regular business hours: Monday through Friday 9 a.m. to 6:30 p.m., and Saturday 9 a.m. to 2 p.m. While there are still a few finishing touches to be made and bit of additional shelving to be installed, the pharmacy has continued all its regular services, and has even added a selection of pet products and services. "We fill a lot of animal prescriptions here, and want to treat our patients' pets, as well as their own needs," said Kim. "I'm surprised at how well those pet items are selling." The Hubbells still provide a home for all the antique pharmaceuticals that have long been displayed in the pharmacy. "We've sorted through them, and we plan another shelf for them all across the north wall," commented Kim. "Currently we have one of the old antique medical cases filled with those, as well as the old penny-weight scale. We've set up a new display on the south wall showing old vs. new medicines used over the years – to treat allergies, stomach upsets, and relieve pain. It's fascinating how medicines have changed over the years!" Pat Hubble observed that they offer shots for flu and pneumonia, and are building a list for shingles vaccine (of which there's a currently nationwide shortage). "The biggest request we have, though," he remarked, "Is that everybody wants an old-style soda fountain here, like the one that used to be in the old pharmacy across the street in the early 1900's. I'll have to wait on that concept until we get settled, though." Besides the brand new hardwood flooring, and the new doors and shelving, Hubbell told THE BEE, "Our new service features include immunizations, delivery, compounding, patient compliance packaging, ADA parking, new vitamin lines and products, and our own T-shirts! We also share the parking lot with nearby businesses. "We have staunch supporters in the neighborhood, and everyone's been so friendly. People still tell me they'll bring in more antique medical items, even though we haven't gotten all the old ones on display yet." For information, or to call in a prescription or a renewal, the phone number is 503/234-3488.